I live in the country with only the occasional deer or coyote to look in my windows, so my house is pretty curtainless. I rearranged my studio and the placement of my desk and computer monitor created a glare problem for me, so I made some 'un-curtains'. Essentially they're just long panels that I can move depending on where the sun is. I made mine fairly skinny because I love my view and enjoy looking out the window. Most of the time I don't want my window covered. I didn't want to do a full blown curtain, so I adapted a bit and came up with this. First I needed to do some measuring. I wanted my panels to just hover above the sill, so I measured from the wire to the sill and subtracted a half inch. Then I added 3 inches to that measurement. My raw measurement was 48.5". 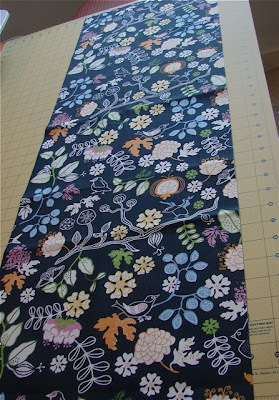 I cut four panels, 13 x 48.5 out of some Ikea fabric that was in a bargain bucket. Then I cut four pieces of lining fabric. I used plain white muslin. Not fancy, but I had it on hand. 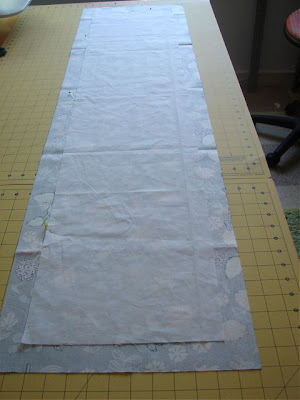 Cut the lining 3 inches smaller than the fabric panels. Mine were 10 x 45.5". 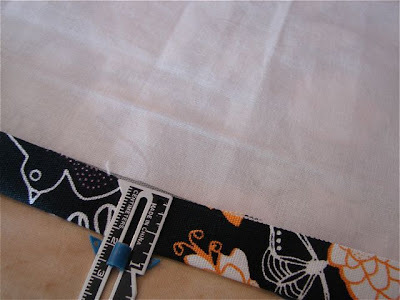 Place the lining fabric on the wrong side of the panel with 1.5" of the panel on each side. 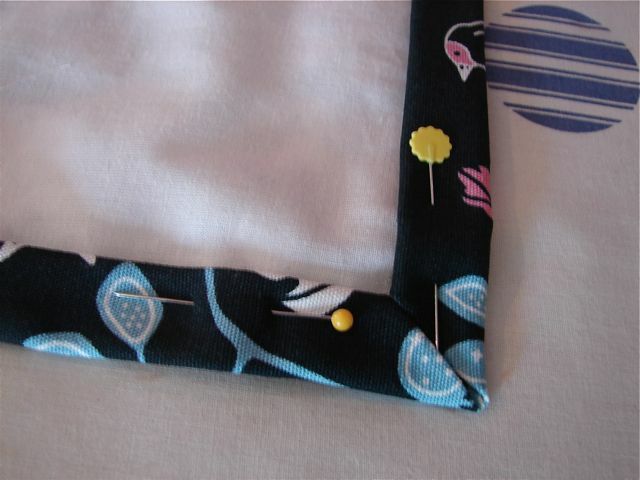 I put in a couple of pins on each side and the ends to help with the placement of the lining. 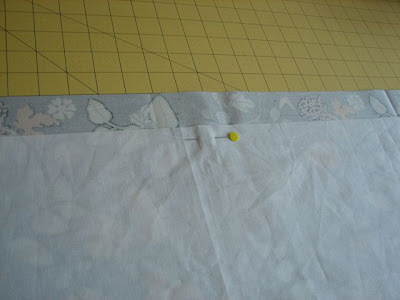 Pin the lining to the panel in a few places to keep it from moving as you head to the ironing board. 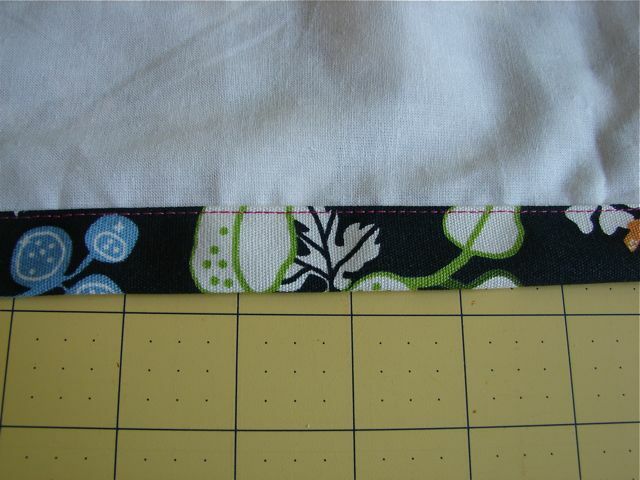 Start by preparing to miter the corners. 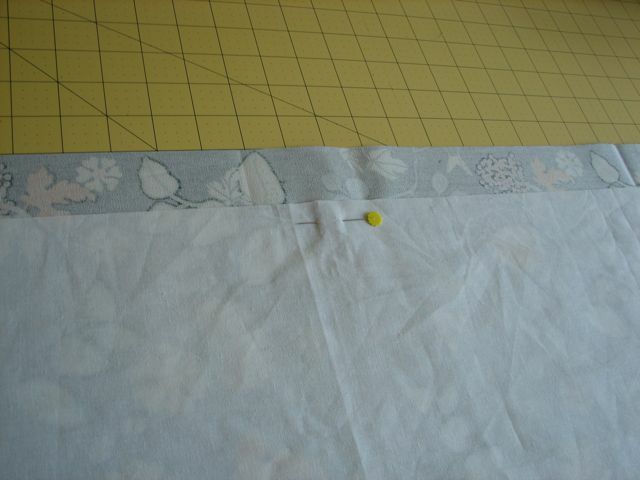 Fold each corner in and press. You can measure 3 inches or just eyeball it like I did. After all corners are pressed in, fold the raw edge of the panel fabric in to meet the edge of the lining and press. You should be folding in 3/4". Press in all the way around the panel. 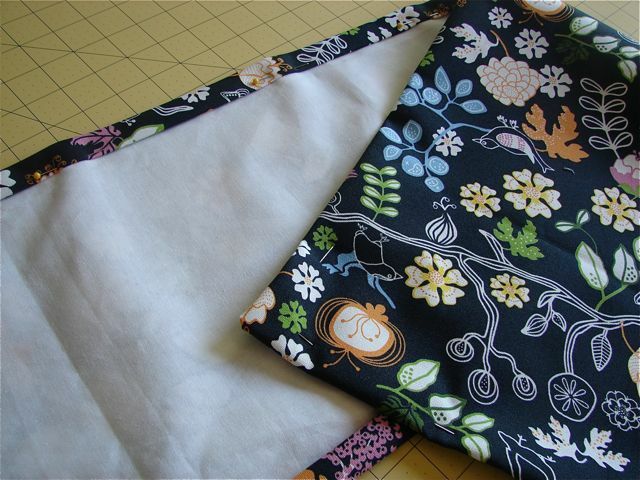 Fold the panel fabric over another 3/4", press and pin. At the corners you'll be completing the miter. Notice you'll create a little extra square of fabric. 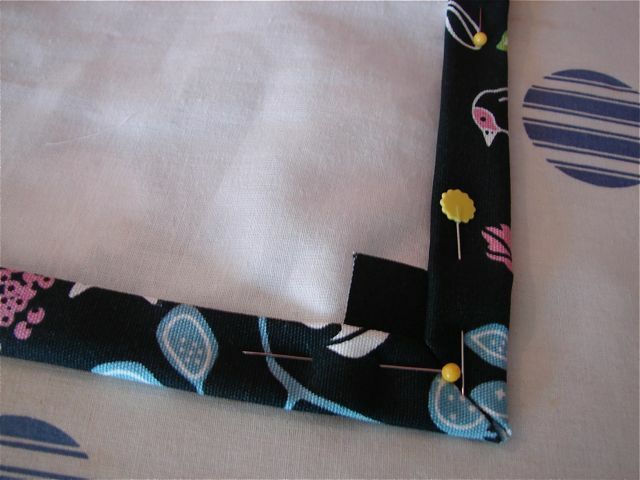 Take out your pins, trim out the square and pin again. Press and pin all the way around the panel. Now you're ready to sew. 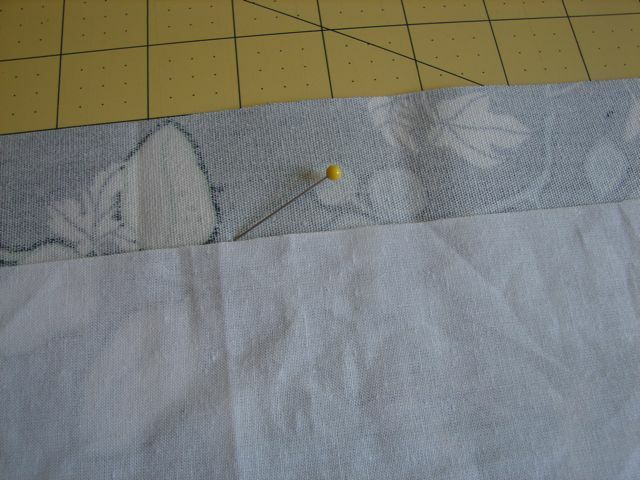 Be sure to change to a topstitching needle for this next step. It makes a big difference. I sew an 1/8" from the edge around the panel backstitching to secure the stitches at the beginning and end. 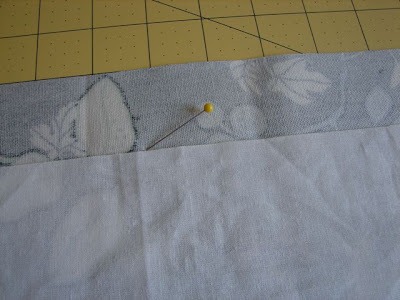 Be sure to keep your needle down in the corners to pivot and stitch the next side. You might want to use matching thread...I chose hot pink thread just for fun! 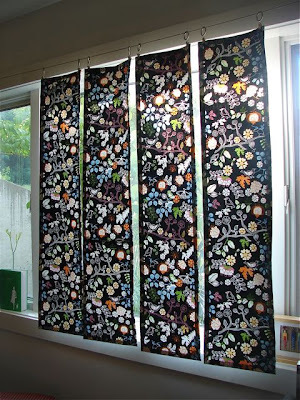 I clipped the panels to my wire curtain rod and here they are blocking that bright morning sun. When the sun moves a bit, I can whisk them to the side and keep my view. I also made a pressing board for my studio out of a pieces of mdf, a piece of fusible batting, some staples and a pieces of the same Ikea fabric, but in the larger scale print. So, two more finishes for me this weekend. Two days left in the Spring to Finish Challenge. Are you making some last minute progress? beautiful! The fabric looks like stained glass with the light coming through. Gorgeous!! 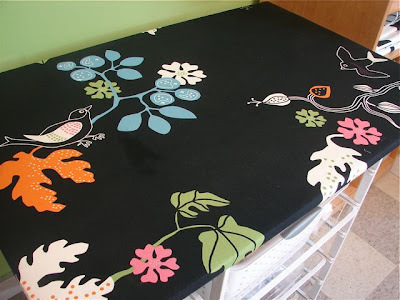 Love your panels and your ironing board is gorgeous!! Progress, HA! I'm finished. *S* Course I had only 3 to do, but one was really, really nasty. I saw someone name that little blue gauge as their fave tool lately, and since then have seen it being used everywhere. 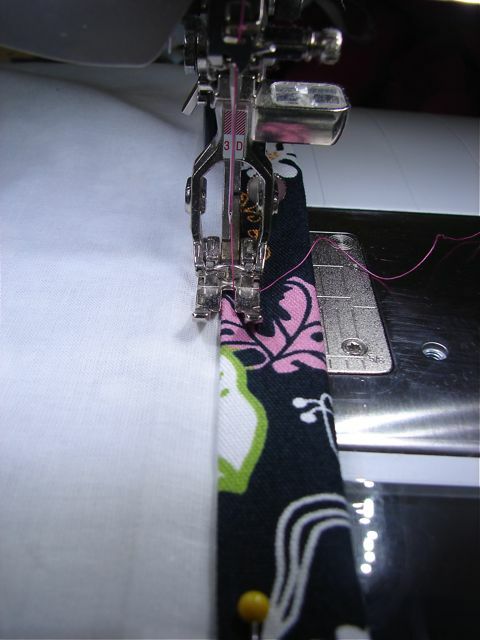 I've had that thing since I bought my Bernina in the 70's. There are just some things that NEED that, aren't there? 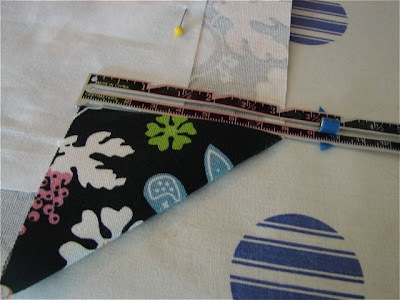 I use it for measuring distance between the blue tape for quilting. Wow, what a clever and stunning way to solve a glare problem! I too love to see out the window but have glare problems as well. I would have never thought of movable curtains as a way to solve the problem! 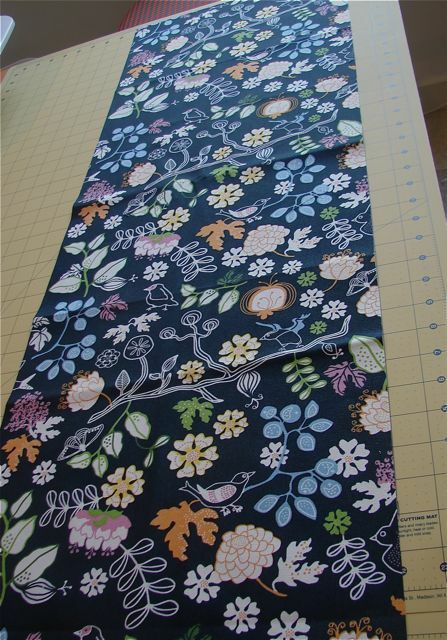 I just posted the last of my Spring Finish pics, can hardly wait to see what everyone made! I'm a HUGE fan of your work! Thanks for all the great visits! Great idea! Those curtains look fabulous! I love my pressing board. The best thing I ever did. these look great! i love the fabric. this would be a nice way to cover the front of open shelving too, maybe. Anyway thanks for showing how you sewed them, for a person who's done mainly quilting, it's good to see some basic sewing techniques. yep, works like a charm --- I did the same thing only used batting and we use them at the office in the winter to keep out our nasty Mn winds! love the print!!! I'd kill for your studio too!!! This is a great idea -- sadly, not going to work for my pretty dense neighbordhood -- but still, great for the house I imagine myself having out in the woods. What a great idea! I actually bought fabric 2 years ago to do the same thing in my sunroom. I love spending time out there, but sometimes the sun is too much! I have two 3-section windows, with the outer 2 sections able to be cranked open. I didn't want a solid curtain covering the entire window that would block airflow, but I wanted something to block the sun. Anyway, a great idea that I have never taken the time to finish. Glad to see this! Great idea. I have that very Ikea fabric. Pretty. 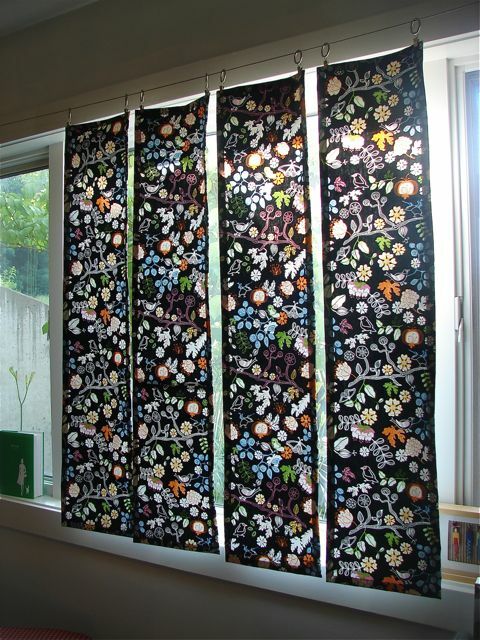 Love, love, love your un-curtain! Perfect for my remote location at 'the end of the road'. Thanks for sharing. I'm re-doing my office this summer. I will certainly steal this idea! As for the finish...hmmmm I wonder what it was I promised for the second finish. Beautiful! Love the stain glass effect. Great idea! I love that your curtain is functional, pretty and still let's you enjoy your beautiful view. Quite an elegant solution! Love the fabric, too. I really like this idea. It looks lovely! The curtain panels are gorgeous! Thanks for sharing the process. Lucky you, to live where you don't need full curtains! So pretty... they look like stained glass! Progress??? I'm supposed to be making progress? Those look great! I love how the fabric you chose lights up with the sunlight shining through like stained glass. What a great idea! I love the wire curtain rod too. Thanks for sharing the "how-to" on the construction technique. I am having one of those "duh, why didn't I think of that" moments. What a straightforward way to line a curtain panel. I need to make something simple for our home office where we have bad glare, and have been dreading the lining process. Maybe this is my next project! this is great! 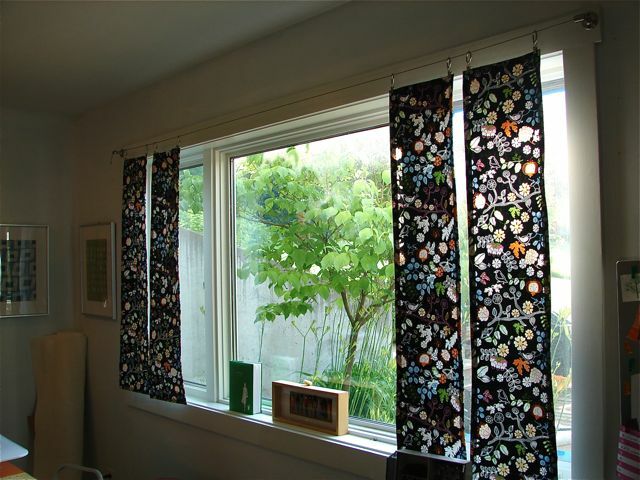 can you explain the wire curtain rod if you made it or tell us where you bought it?? Don't you just love fabric from IKEA!!! It's really nice the way the sun light comes through the designs on the fabric. what a great idea! I need to stock up on some ikea fabric soon. Great idea! They remind me of stained glass with the bit of light coming through the print. LOVE this! What a great idea!!! What a fabulous idea this is, Jacquie! I love the way they can be moved to the "sunspot" as needed. I love this idea!! It looks like your window is a piece of artwork. Oh I just love this idea. Like you we live out in the country and my studio looks out onto our woods. I was looking for something for the window for the sun (my sewing & drafting table face the window) but I didn't want curtains to cover the whole window. My daughter's curtains are made out of the larger scale fabric. I think it's one of the best fabrics they have! Great job on your panels, they look really wonderful! I love this idea. Having much the same surroundings this would be a great fix for that southern exposure in the winter. Glad I saw this.